jBilling can submit payments to virtually any payment gateway in the world. 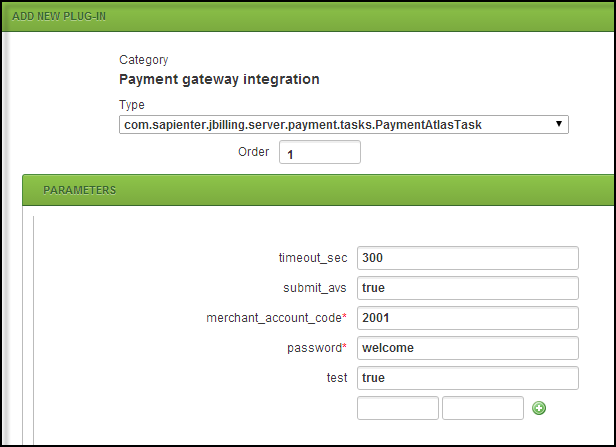 For this to happen, however, you need a payment processor plug-in that handles the payment requests to the gateway. Once your request is submitted, the Intrannuity staff will contact you and will guide you through the merchant signup process. Upon completion, you will be given a Merchant Account Code and Password necessary to configure the plug-in and to process credit cards. Select 'System' and then 'Plug-ins' in the main menu. Once the form appears, click on the link at the bottom that says 'Add a new Plug-in.' This will create a new row in addition to any already existing rows for plug-ins. Click on 'Add parameter' below the new task five times. Refer to Figure 1 below. The merchant account code is used to track transactions associated with a specific merchant. This is a required field. Replace ‘parameter_name’ with ‘merchant_account_code’ and ‘default’ with the value provided by Intrannuity. The password is used in combination with the merchant account code to facilitate the authorization process. This is a required field. Replace ‘parameter_name’ with ‘password’ and default with the value provided by Intrannuity. The parameter indicates whether you want track data and cvv2 values to be sent during the transaction authorization. These values are not required, but they are highly recommended to reduce the possibility of fraud and to lower your transaction processing fees. Replace ‘parameter_name’ with ‘submit_avs’ and ‘default’ with either ‘true’ (recommended) or ‘false’. The test parameter indicates whether the transactions are processed via a real production server or via a staging server, which duplicates all functionality of the production server but doesn’t perform any charges. The test mode should be used for testing purposes only to ensure that everything is configured correctly before going live. For live transactions, this value should always be false. This field is required. Replace ‘parameter_name’ with test and ‘default’ with ‘true’ (test server) or ‘false’ ( production server). The 'timeout_sec' parameter indicates the time in millisecond before a transaction is timed out. Replace ‘parameter_name’ with 'timeout_sec' and ‘default’ with a value in milliseconds. This field is required. The recommended value is 180000 milliseconds (3 minutes). Be sure to remove the task 'com.sapienter.jbilling.server.pluggableTask.PaymentFakeTask.' This is supplied as a default transaction processing plug-in which doesn’t actually process any charges. You are now ready to use jBilling to process transactions with Intrannuity’s Payment Gateway. Additional fraud protection and transaction-validation filters can be configured for your account using Intrannuity’s gateway management portal.